Fresh cut grass, the crack of the bat, and 2019 Topps Opening Day Baseball. Helping get the new collecting season underway, the entry-level set relies more on the fun of collecting than the big hits that typify other releases. Like in 2018, the inexpensive product only promises one insert per pack but there are still some rare options to chase. 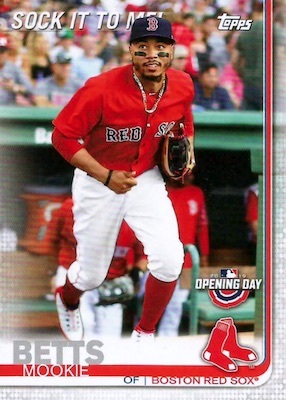 Taking the flagship design and adding an Opening Day logo, the base set in 2019 Topps Opening Day Baseball works with 200 cards. Many of these subjects are also found in 2019 Topps Series 2 Baseball. Limited parallels include Opening Day blue foil, with a reported 2,019 copies, plus the black Opening Day 1/1 Edition and Printing Plates (1/1). There are also 30 Base Variations featuring a different image for key players. These have limited signed versions, as well. 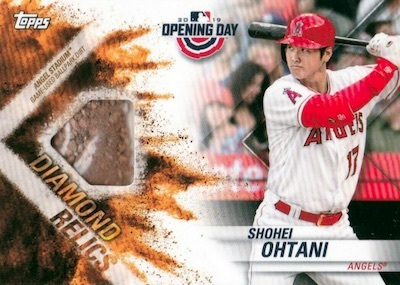 While the recycled base design shows little creativity, 2019 Topps Opening Day Baseball stands out with a large selection of inserts. New themed sets include 150 Years of Fun, which looks back to identify images of players having a good time playing ball, and Rally Time!, the set dedicated to all the little quirks on display when the game is on the line. In addition, Sock it to Me! showcases players in high socks. 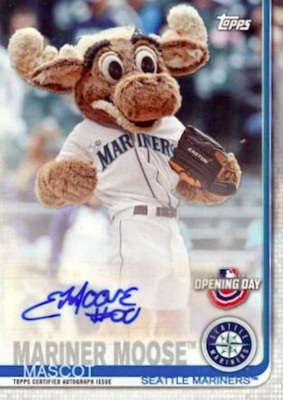 Among the returning inserts, Dugout Peeks covers the action just off the field, Mascots again tackles the furry creatures, and Team Traditions & Celebrations highlights interesting events from each franchise. Lastly, the Opening Day insert shows player images from the first game of 2018. 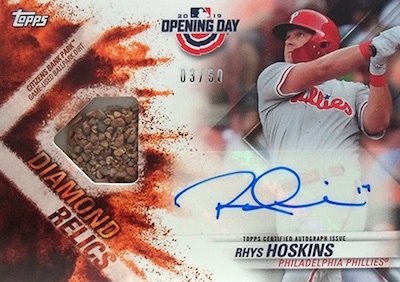 Closing out 2019 Topps Opening Day Baseball with hits are the rare signatures and memorabilia. 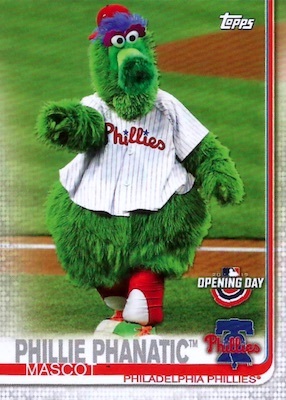 The Opening Day Autograph cards use a brick background to draw extra attention, and there are also Mascot Autograph and Mascot Autograph Relic cards. Getting a little dirty, the Diamond Relic and new Diamond Autograph Relic inserts contain actual dirt from the stadium associated with the player. Rounding out the release are the Mascot Relic and Opening Day Relic cards. 2019 TOPPS OPENING DAY MICHAEL KOPECH RC AUTOGRAPH AUTO CARD HOT!!! 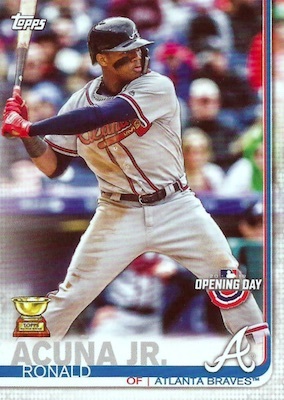 2019 Topps Opening Day Redemption Auto #ODA-RA Ronald Acuna Jr.
Purchase 2019 boxes direct from Topps. PARALLEL CARDS: Blue Foil OD, Red Foil OD (Target Mega Box), Opening Day 1/1, Printing Plates 1/1. 30 cards. Full guide and gallery. 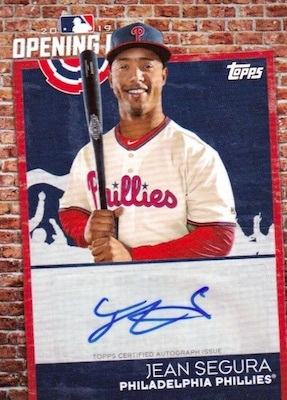 Buy 2019 Topps Opening Day autographs on eBay. View the 2019 Topps Opening Day Baseball checklist Excel spreadsheet. Rally Time!, the set dedicated to all the little quirks on display when the game is on the line. 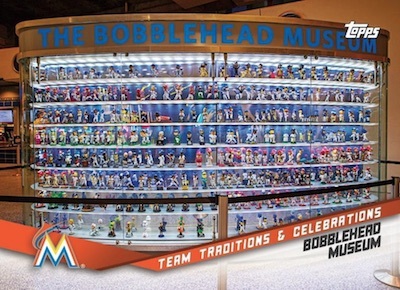 Team Traditions & Celebrations highlights interesting events from each franchise. Here are the inserts I am looking forward to. My opinion will most likely change when these are released based on what they look like. Even though I like them now that does not mean that I will when they are released depending on what the look like. 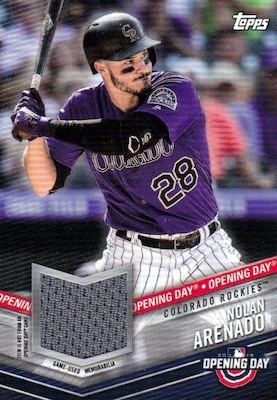 For the Rally Time, if they do not have the rally guy for the rockies from a few years ago I will not collect the insert set no matter how much I like it. Anyone who was at the rally guy game knows what I am talking about. Who wants to guess that my favorite mascot will once again not have an auto but all the ones they have done every year will. 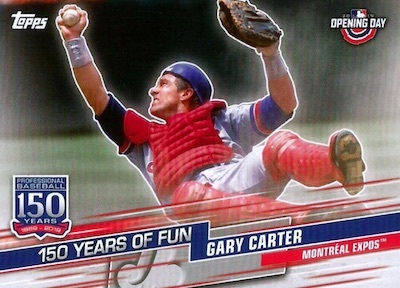 Hey topps start putting different mascot autos in this product instead of the same ones year after year. I want want to point out Topps has tried to sell relics of tablecloth, and now literal dirt in the past few days….cmon guys. Topps needs to check the disabled list once in a while. For example, Sean Manaea was shut down last year, had surgery and is not expected back this season let alone be the opening day pitcher for the Oakland A’s. Mascot Relic? You have got to be kidding me. I don’t like it, but it’s for the kids. I’m buried under a mid-life crisis, and not in the demographic. I like the blue foils that they have with this set, the mascots, and the 150 Years of Fun. It’s a nice price point and just about anyone who enjoys collecting cards can afford several packs. You never know what you may get. A few years ago I found a mascot autograph card, which was a fun addition to my personal collection. This product shouldn’t be legally allowed to mention the hits. 4 boxes now and nothing but blue foils and an obnoxious amount of doubles. Even if this is “designed for kids” it’s not very exciting at all. Some people won’t even take free packs of it. Stop the nonsense and put 1 hit in each box. Red Sox win theWorld Series and no significant hits at all from the team? Not even 1 autograph? I think I’ll pass on this one. 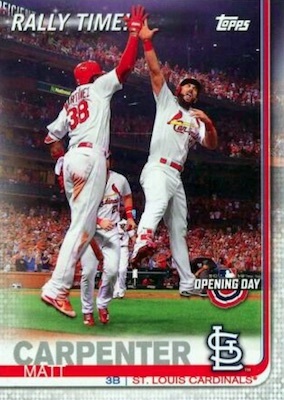 Topps has become weak- I wish they would have exciting cards like Panini. Panini in my opinion is better even WITHOUT the team logos etc. Fun product to open with my nephew he is 7. We opened a few Mega Boxes from Target and hit a Judge Rally Time Sp he was pumped since he is a Yankee Fan. I also saw people doing case breaking of this, really? STOP RUINING THE HOBBY CASE BREAKERS! OPENING DAY IS FOR CHILDREN. How is there no CODY BELLINGER???? But there’s a Chris taylor sock it to me??? ?